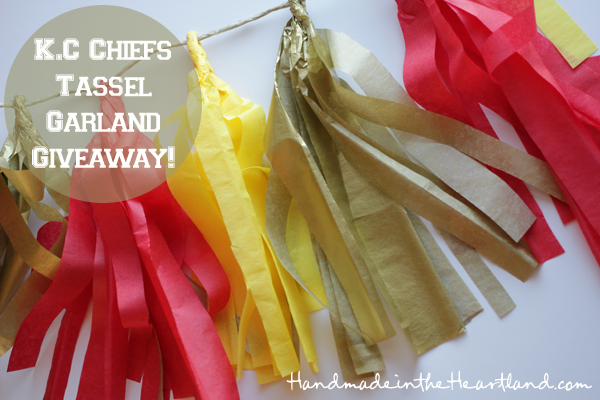 KC Live Chiefs Party + Chiefs Tassels Giveaway! 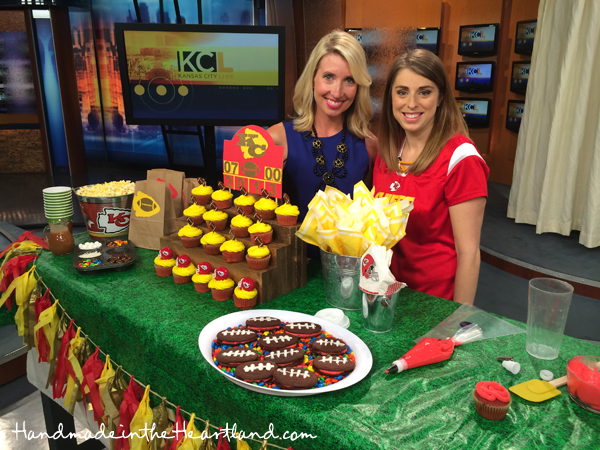 Home Holidays Parties KC Live Chiefs Party + Chiefs Tassels Giveaway! I had so much fun this morning on KC Live. 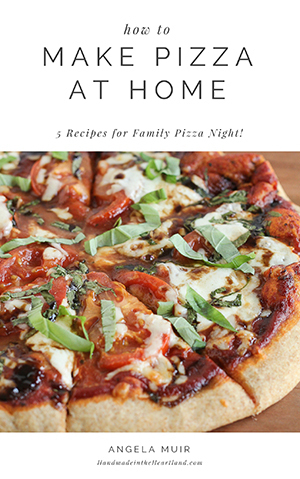 I showed some ideas for a Chiefs watch party, but lots of these ideas can be used for any football or fall party. I will be sharing all of the DIY’s and recipes throughout the week so be sure to check back for a tutorial on how to make the stadium seating cupcake stand, the silhouette cut out scoreboard, recipes for the red velvet cupcakes and the football shaped sandwich cookies. I also talked about having a popcorn bar with homemade caramel. You can see that recipe HERE, its so versatile i use it all the time like on my salted caramel cheesecake & banana spring rolls . Matt eats it plain by the spoonful :). It was super fun to see Melanie Knopke who happened to be doing a segment on the show as well. I met her at Go Blog Social and kept up with her via instagram and her blog. She is such a sweet and stylish lady! The second DIY decor item i took to the show today was this tissue paper tassel garland. I love that these tassels look like pom-poms, that they are easy to make and that they don’t cost you nearly anything! I used THIS tutorial to make them. One sheet of tissue paper makes 4 tassels, so 1 package of each color that you want to use is plenty! So i mentioned on the show that i am giving away 2 strands of Chiefs tassel garland! If you are a Chiefs fan please enter to win below. I will send them out to you, or if you live close i might even drive them over :). The Contest begins tonight and ends Friday afternoon, so hopefully i can get them to you by Sunday’s big game! Also friends don’t forget about the Rodan & Fields Giveaway HERE.